Wednesday? Did you say Wednesday? Wow, time sure flies. Here it is time for another Watercooler Wednesday Challenge. 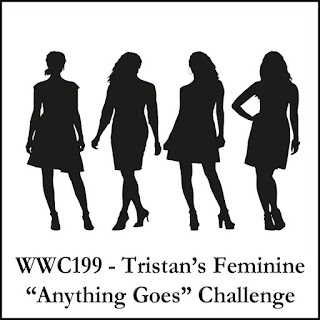 Tristan is hosting our Feminine "Anything Goes" challenge this week and there are some lovely projects from our Design Team that you don't want to miss. One of the things I loved about Stamp Joy 2018 is that I came home with 14 new cards that I can use for upcoming events. This is one of the Make 'n Takes we made using this cute cat image. For all of our challenge details and to share your project, visit the Watercooler Wednesday Challenge by clicking the image below. We’d love to have you join us. You have until Monday, December 10th at 4:00 p.m. Pacific Standard Time to link up your project. 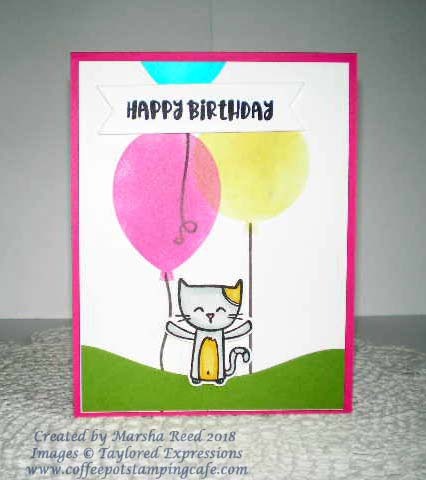 This is such an adorable card you've created at Stamp Joy 2018, Marsha. Great colours and fun image. Thanks, Heidi! Her event is such fun and I'm going to miss it.